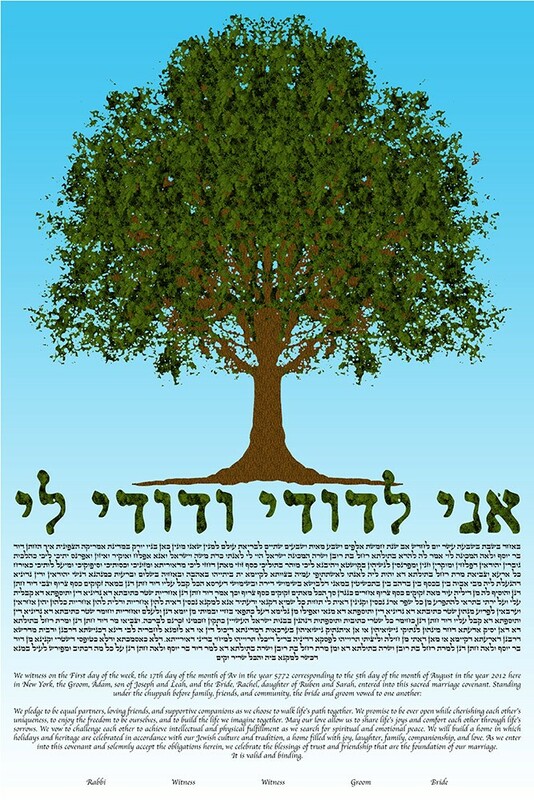 A single grand tree stands its ground against the blue sky in this nature inspired ketubah. The tree is fashioned in the style of a computer generated image with no added details. The thick trunk of the tree signifies many years of growth and a durable strength that only gets stronger with time. The lush green branches portray a healthy tree which is well nourished and cared for. This ketubah is great for people who find stability in their relationship. Man has depended on trees since the dawn of time for food, shelter and warmth, and still continue to do so; relationships from which couples draw emotional support are akin to a strong and weathered tree. The toughened connection developed between two people is hard to break and only gets stronger with time.